Your itinerary includes some good beach time at Manly Beach and Shelly Beach. 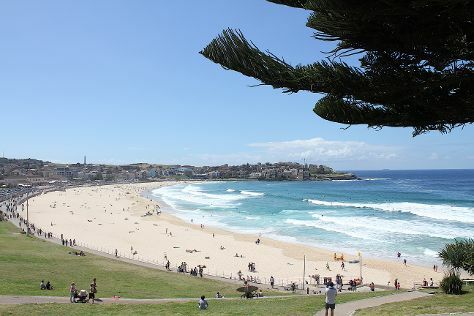 Get in touch with nature at Bondi Beach and Speed Boats Tours. When in Sydney, make a side trip to see Palm Beach in Palm Beach, approximately 1h 05 min away. And it doesn't end there: indulge your taste buds at The Rocks Markets, hike along The Opera House to the Botanic Gardens Walk, take in the views from Sydney Harbour Bridge, and get a taste of the local shopping with Queen Victoria Building. For more things to do, traveler tips, and tourist information, use the Sydney trip itinerary builder tool . If you are flying in from United Kingdom, the closest major airport is Sydney Kingsford Smith International Airport. In February, daily temperatures in Sydney can reach 31°C, while at night they dip to 23°C. Finish up your sightseeing early on the 24th (Mon) so you can go by car to Leura. Leura is a suburb in the City of Blue Mountains local government area that is located west of the Sydney central business district in New South Wales, Australia. Start off your visit on the 25th (Tue): look for gifts at Josophan's Fine Chocolate, take in the dramatic scenery at Wentworth Falls, then skim along the rocks with a canyoning and rapelling tour, and finally get great views at The Three Sisters. To see photos, more things to do, ratings, and more tourist information, read our Leura travel route planner. You can drive from Sydney to Leura in 1.5 hours. Alternatively, you can take a train; or do a combination of bus and train. February in Leura sees daily highs of 33°C and lows of 20°C at night. Cap off your sightseeing on the 25th (Tue) early enough to go by car to Oberon. Oberon is a town and local government area (see Oberon Shire) in the central tablelands of New South Wales, Australia. Kick off your visit on the 26th (Wed): walk around The Oberon Common and then admire the natural beauty at Mayfield Gardens. To see more things to do and tourist information, go to the Oberon journey planner . Drive from Leura to Oberon in 1.5 hours. Cap off your sightseeing on the 26th (Wed) early enough to travel to Pokolbin. Kick off your visit on the 27th (Thu): enjoy the sand and surf at Merewether Beach, take in the pleasant sights at Newcastle Memorial Walk, and then revel in the low prices at Mortels Sheepskin Factory. To find reviews, other places to visit, and tourist information, refer to the Pokolbin trip itinerary planner . Traveling by car from Oberon to Pokolbin takes 4.5 hours. Expect a daytime high around 32°C in February, and nighttime lows around 20°C. On the 28th (Fri), you'll have the morning to explore before heading back home.